I read his blog,and boy am I sure glad I did. 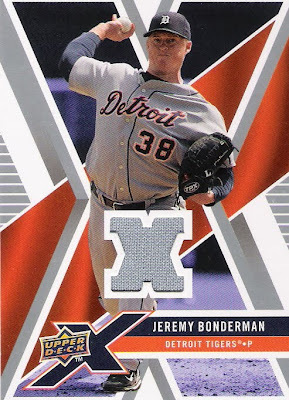 I'm trying to complete the 2009 Topps Updates & Highlights set, and today I got a package in the mail from fellow 2009 Topps Updates & Highlights set collector, Jeremy of the blog no one's going to read this blog. Jeremy and I arranged to help each other out on this set. He sent me 8 cards that I needed plus a bunch of D-Backs cards (Schlereth Auto!) 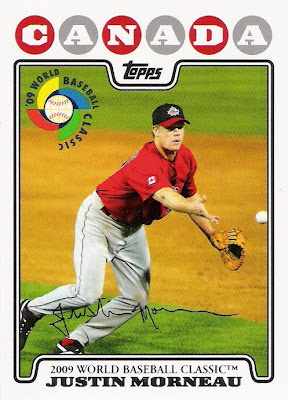 and I sent him a couple of cards he needed plus some Turkey Red and Propeganda insert cards. 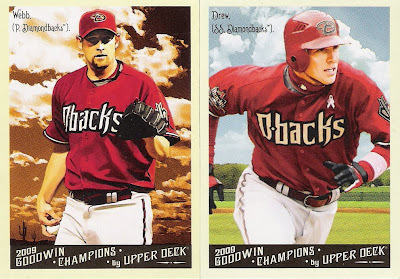 Here are a few of the Updates cards and some of the Diamondbacks cards that Jeremy sent. Thanks Jeremy! 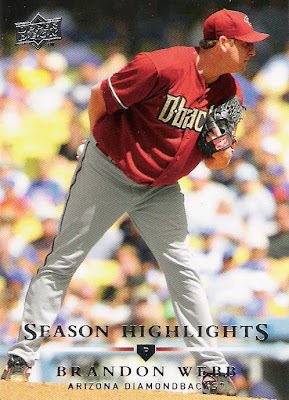 Randy Johnson Season Highlight card of 300th win - Why didn't the D-Backs resign him so he could get number 300 in a D-Backs uniform? 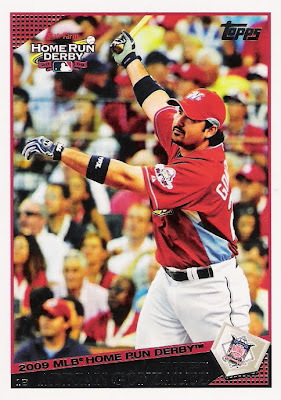 Adrian Gonzalez Home Run Derby card - The Home Run Derby is my favorite part of the All-Star game. 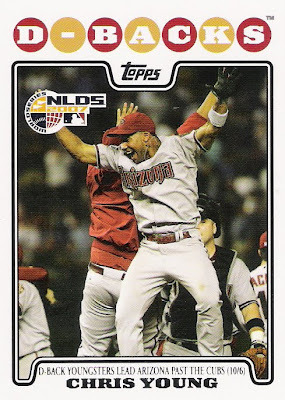 The D-Backs celebrating beating the Cubs to advance in the 2007 playoffs. 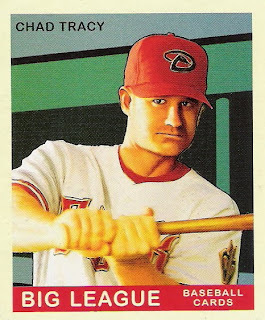 2007 Goudy Mini of Chad Tracy - Chad will not be a D-Back next season. 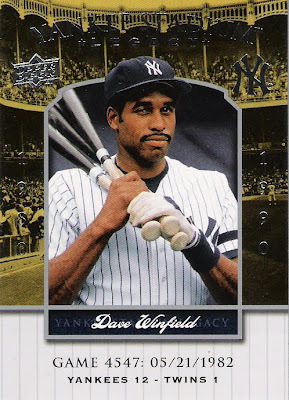 Injuries prevented him from living up to his full potential. 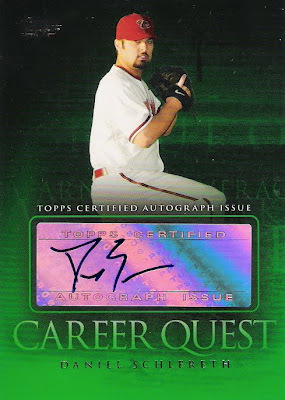 2009 Topps Updates & Highlights Career Quest Autograph of Daniel Schlereth - It's always sad to see a young promising arm leave your favorite team, but I wish Mr. Schlereth much success in Detroit. I had been wanting to get a Schlereth auto for a while and then Jermey offered this as part of the trade. Thanks again Jeremy! 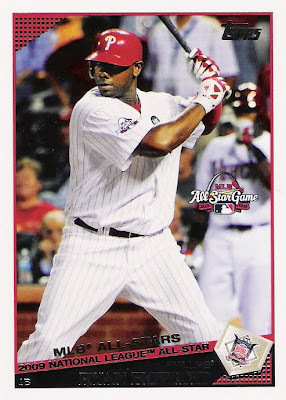 In a moment of weakness this morning, I purchased a 2008 Topps Updates & Highlights blaster from Wal-Mart. It was 40% off! It guaranteed a relic! When will I learn, when will I learn. 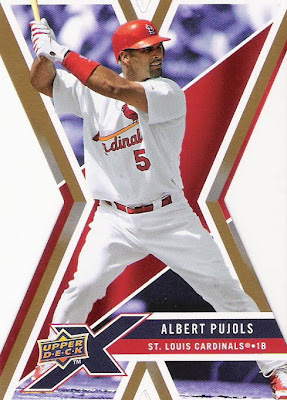 My card money is better spent on single cards that I actually want, rather than on packs and boxes. 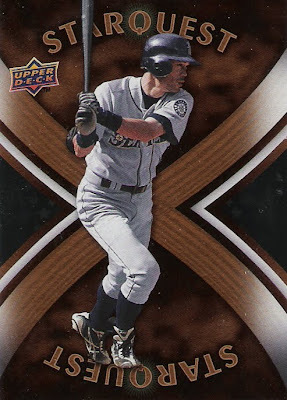 So, please help me and trade me some D-Backs for what I got in this blaster. 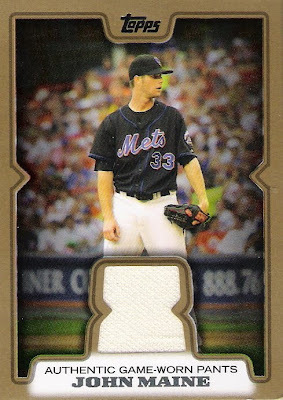 I did get the Jay Bruce RC, which somehow did not get scanned. 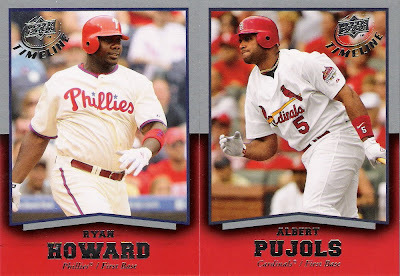 If you are working on this set let me know what cards you need to see if I can help. Thanks! Got this in the mail today. I picked it up on ebay for $0.99 + $4.00 shipping. 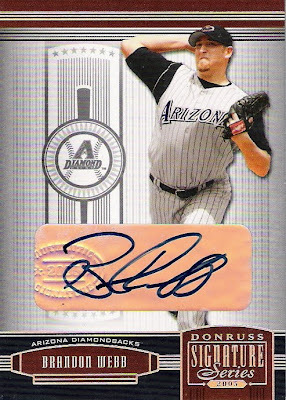 $4 is a lot for shipping, but I still consider $5 for a Brandon Webb autograph to be a pretty good deal. 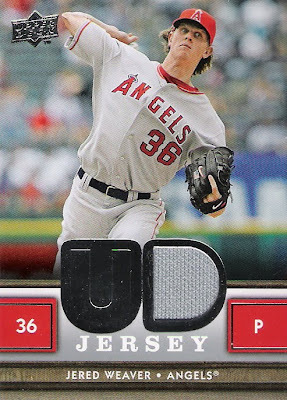 It's not numbered or anything but I like the design of the card. 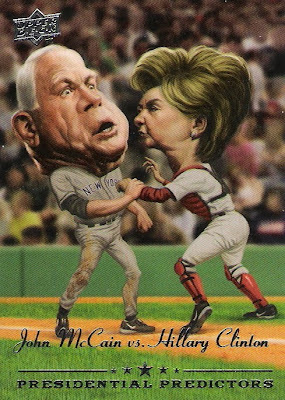 I know that there are numbered versions of this card and I would love to get one of each variation. About a month ago Wicked Ortega of the blog My Past Time ....... I Love It!! asked if anyone would be insterested in trading cards for MacFarlane figures that he had. 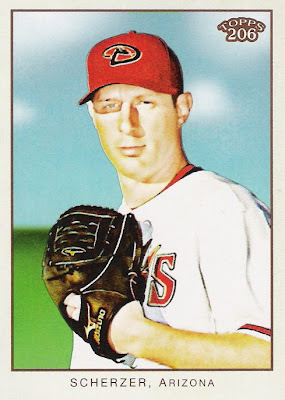 I emailed and told him that I was interested in the Randy Johnson and we worked out a trade. 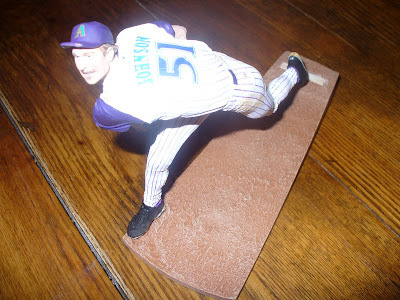 I sent him a stack of Manny Ramirez and David Ortiz cards and he sent me the Randy Johnson figure pictured below. 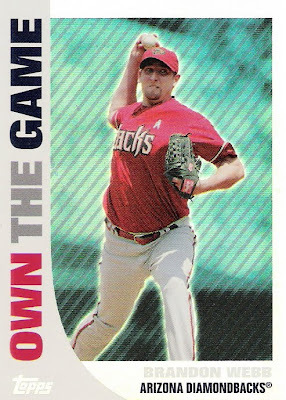 He also sent me a few D-Backs cards and I am going to show you a few of my favorites. Thanks Alfredo! The pictures don't do this justice. It is awesome! 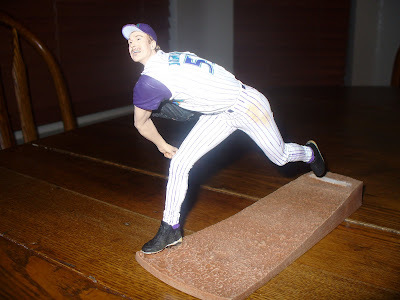 I have a few other MacFarlane figures, but this is my first of Randy Johnson. 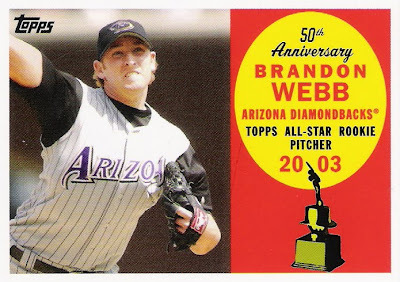 2008 Upper Deck Season Highlights card of Brandon Webb - Great looking cards commemorating Webb's 42 consecutive scoreless innings pitched in 2007. 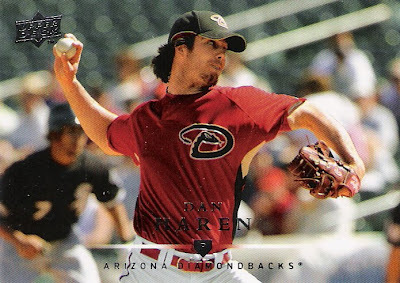 2008 Upper Deck Dan Haren - I really like the photos that Upper Deck used for the 2008 set. Here is a good one of Haren pitching in Tucson during Spring Training. 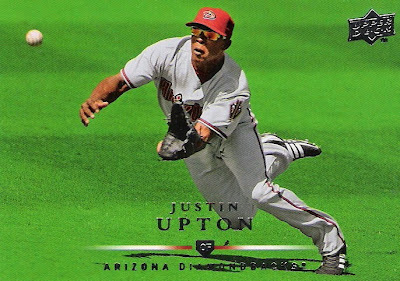 2008 Upper Deck Justin Upton - Great action shot! 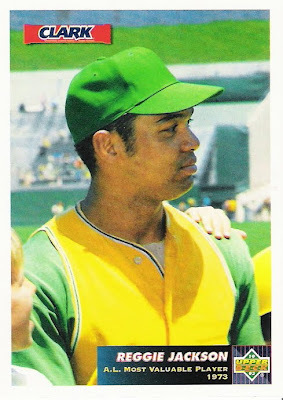 I love it when you get to see the entire player on the card. I love the green grass as a background. 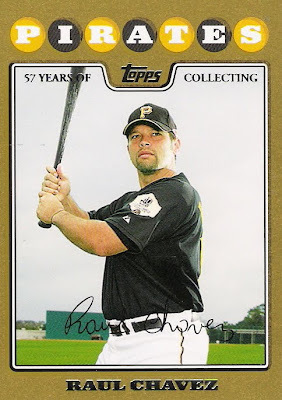 2009 UD Goudy Chris Young - I have seen some really interesting Goudy cards, and when I say interesting I mean horendous. 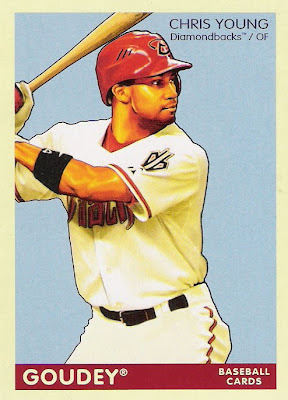 But I really like this Chris Young card. 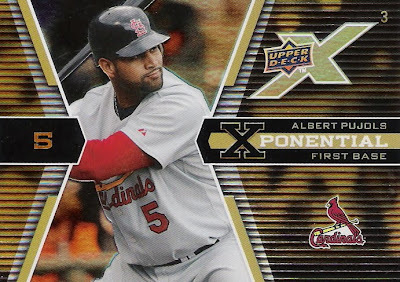 2008 Upper Deck X XPONENTIAL Brandon Webb - I have purchased some 2008 Upper Deck X recently and these XPONENTIAL insert cards are growing on me. I would like to get all 4 of them for Brandon Webb. 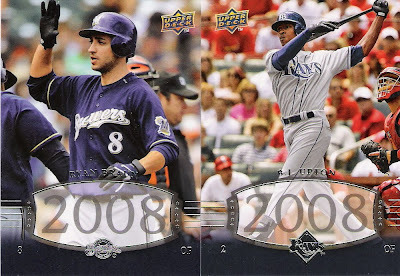 I recently purchased 3 packs of 2008 Upper Deck Timeline at the Dollar Tree store for $3. I had not previously purchased any Timeline, as I am just getting back into the hobby this year. For 3 bucks I was pleasently surprized. 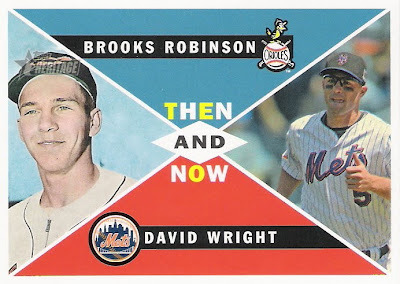 I liked the simple design and I also got some good players.I recently purchased 2 packs of Topps Heritage High Numbers at Target for $2.99 each. I wasn't impressed and I would have rather gotten 6 more packs of Timelines from the dollar store for the same price. 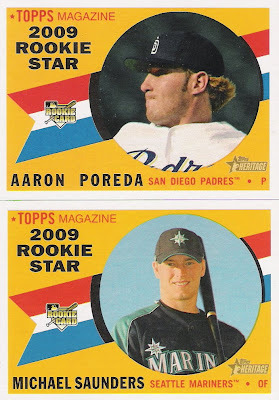 Jake Peavy, Brandon Webb and John Smoltz - These 3 came out of the same pack. I have two boys, one is almost 2 and the other is 3 and a half years old. 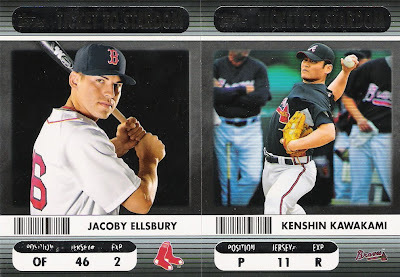 I wanted to get them each their first pack of baseball cards this year for Christmas. During one of our many holiday related trips to Wal-Mart I spotted a 2008 Uper Deck X blaster for 40% off and decided to pick it up and put a pack in each of their stockings. Well, that left eight extra packs. So, first I will detail each of my boys packs and then I will show what remained in the left over eight packs. 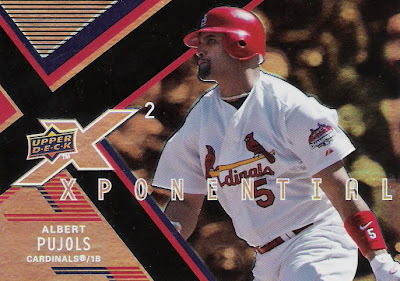 Albert Pujols - This card was on top. Not a bad start to a collection. 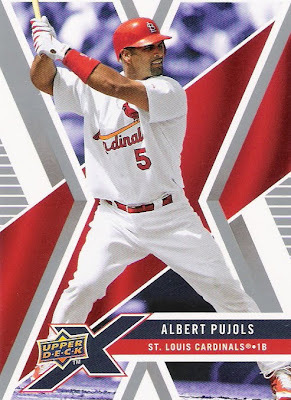 This was actually just one of many Pujols cards from this blaster. 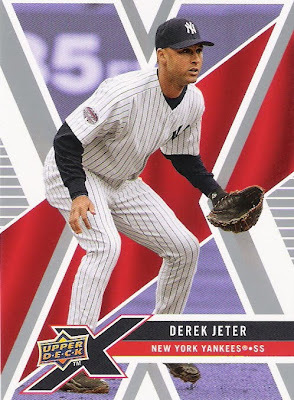 Derek Jeter - This card was on top. Also not a bad start to a collection. Now onto the rest of the blaster. 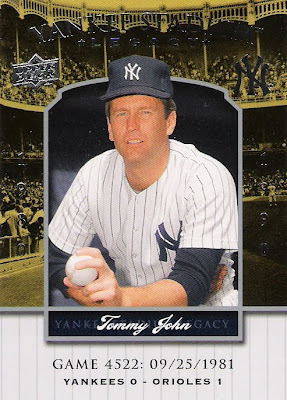 I got two other Yankee Stadium Legacy cards. 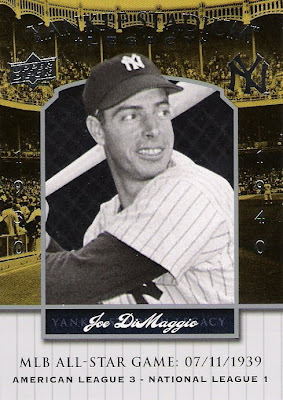 Well, one other one and another Joe DiMaggio. 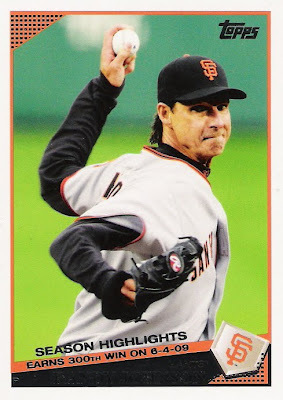 Not a bad blaster if you ask me. And at 40% off, it's even better. I'm sure I'm not the only one who bought themselves a Christmas present this year. Maybe I'm just the only one willing to admit it. Oh well! 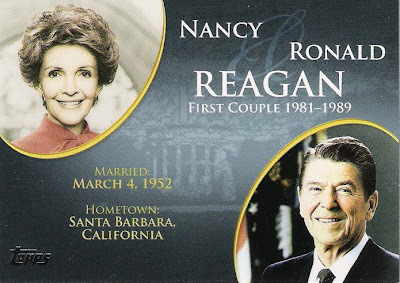 I picked these two cards for myself this year on ebay. One arrived Christmas Eve and the other the day after Christmas. 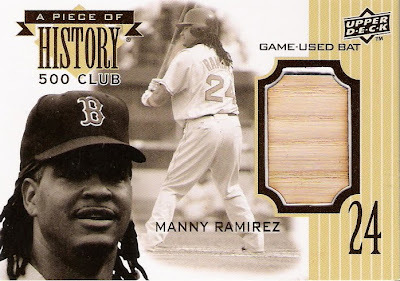 2008 Upper Deck A Piece of History 500 Club bat card of Manny Ramirez - I was watching a few of these on ebay. One auction and several Buy-It-Now's. The one auction ended at $52 and some change, so I jumped on the Buy-It-Now priced at $25 plus $5 shipping. 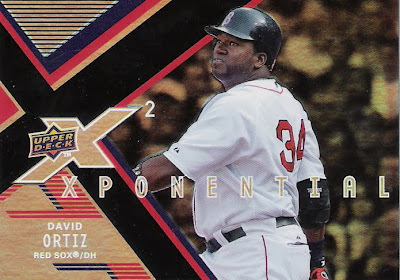 That is the most I have paid for a single card in a long time, but I am trying to get a bat card of every 500 Home Run club member, so I couldn't pass it up. 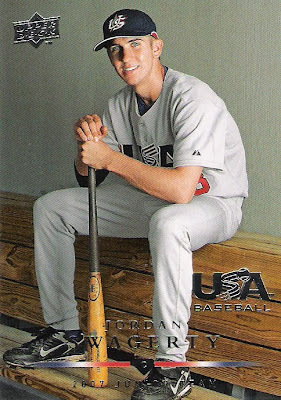 2009 Topps Ticket to Stardom Opening Day Ticket Stub card of Brandon Webb numbered 19/50. 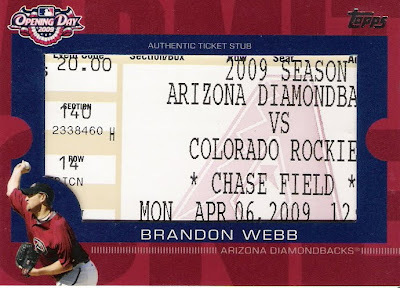 - Card features actual ticket stub from 2009 Opening Day, Diamondbacks vs. Colorado Rockies. 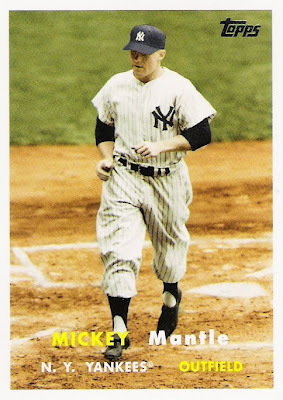 I had seen this card on ebay and tried to get it once but was outbid at the last second. This time I outbid somebody else at the last second. Anyone ever had a "Reggie" bar? 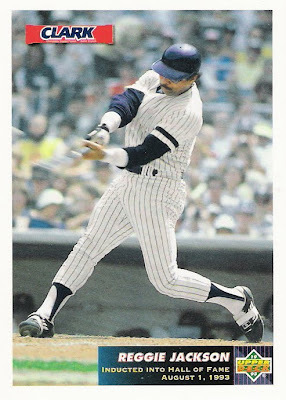 I know that the Reggie Jackson inspired "Reggie" candy bar first appeared in the late 1970's. 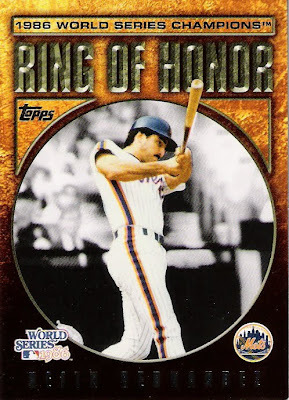 In 1993, to commemorate his induction into the Baseball Hall of Fame, Clark (Candy Company) and Upper Deck teamed up to reissue the "Reggie" candy bar. 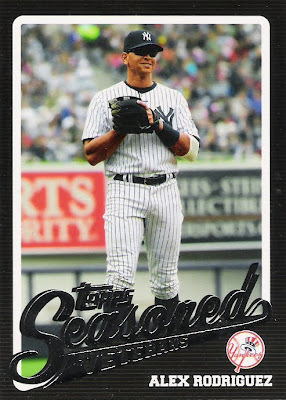 This time each candy bar came with a Reggie Jackson Upper Deck baseball card. 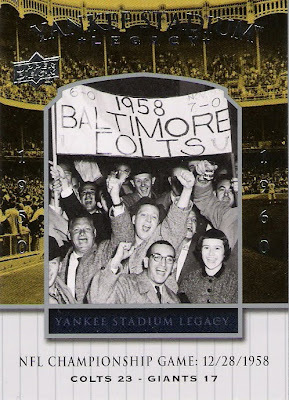 There were 3 different cards in the set, 2 of Jackson in New York (minus the Yankee logo) and 1 with Oakland (minus the A's logo). 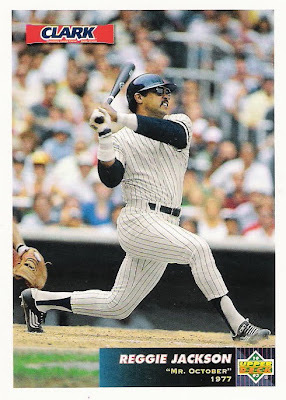 I remember my Dad buying a big box of the "Reggie" bars at Sam's Club (or whatever it was called in 1993) so I have 5 sets (4 extra) of the Reggie Jackson candy bar cards, plus a few other single cards. If anyone is interested in a set, let me know. First come, first serve. 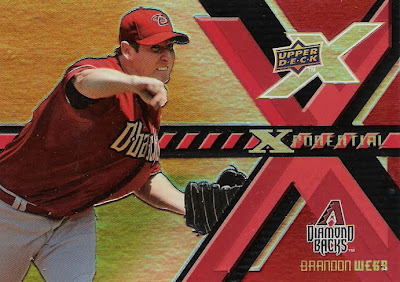 Just send me some D-Backs cards in return. Thanks! The day before Christmas, our door bell rang and when we opened it we saw a pile of presents. Their was one for my wife and both of my boys, as well as one for me. Mine was two blasters. 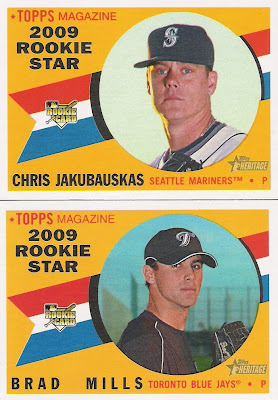 A 2009 Topps Ticket to Stardom and a 2008 Upper Deck Series 2 blaster. We have a pretty good idea of who our Secret Santa is, but know one will confess. So...thanks to whoever it was! Now onto the highlights. 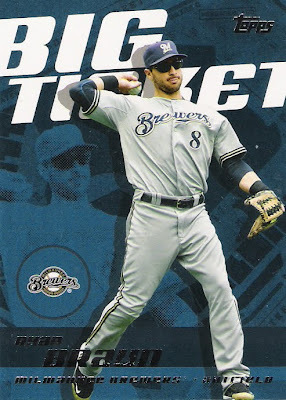 Big Ticket insert of Ryan Braun - I seem to pull a lot of Braun cards, no big hits, but lots of inserts. 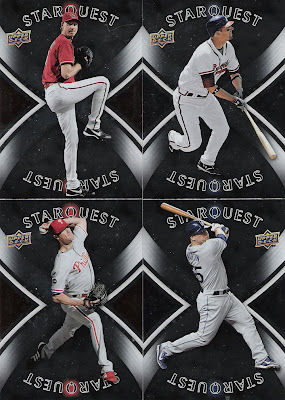 Here are 4 of the common Starquest cards I got. Randy Johnson, Jeff Francoeur, Cole Hamels amd Russell Martin. 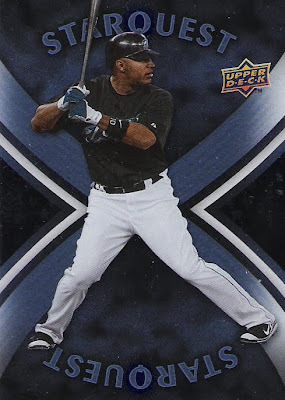 I also got Jimmy Rolins, Vladimir Guerero, Carlos Beltran, and Felix Hernandez. 1992 Score Dream Team - Cal Ripken Jr.